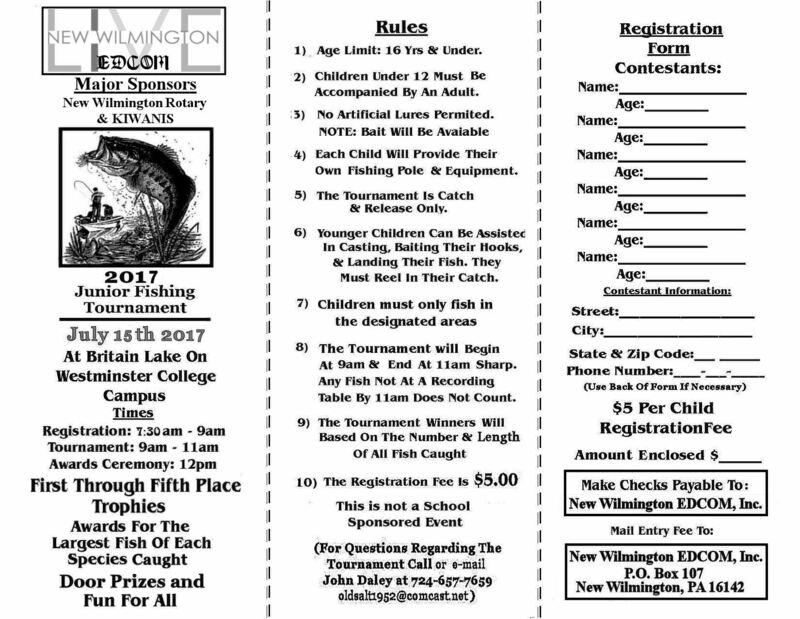 NEW WILMINGTON, Pa.– New Wilmington will host its 2018 annual Junior Fishing Tournament, July 14 at Westminster College’s Brittain Lake. Children 15 years and younger may register. Contestants may pre-register by printing the form here. You can also register the event-day starting at 7:30 a.m. Cost for the tournament is $5. LIVE New Wilmington organizers are working together with the local Rotary and Kiwanis clubs on this year’s tournament. They will award trophies for the largest of each 14 species of fish caught before 11 a.m. Each child will be given a bag of goodies for participating. Questions may be directed to John Daley, tournament manager, at (724) 657-7659.